Book 4 in Amy Clipston’s Hearts of the Lancaster Grand Hotel series releases TODAY! A Simple Prayer is the long awaited 4th novel in Amy Clipston’s “The Hearts of the Lancaster Grand Hotel” series and it releases TODAY! Yes, I got an early look! I LOVE being a book reviewer! This has been one of my absolute favorite series! In A Hopeful Heart, Hannah met Trey… and had to face a very hard decision. In A Mother’s Secret, single mother, Carolyn (not something you typically read in an Amish novel by the way) the love of her life… it just takes some time to figure that out. In A Dream of Home, we meet our most unlikely couple and we get to watch them go through such an unexpected courtship. It’s so very exciting! And what a powerful story. You’re not going to want to put this book down! Come watch the sparks fly between Linda Zook and Aaron Ebersol. You won’t want to miss a second of the show. And those aren’t the only sparks in this story – There is quite a bit of friction between Aaron and his brother Solomon as well. Life has taken much from Linda Zook. Now she dares to hope for a chance at love and a new beginning. Linda Zook, 32, works part-time at the Lancaster Grand Hotel. As the sole survivor of a buggy accident that left her orphaned at age four, she was raised by her unwilling Uncle Reuben. Linda longs to be worthy of someone, but the life-long effects of her injuries and her upbringing under the care of her embittered uncle have destroyed her self-worth. Aaron Ebersol, 32, left the Amish community 17 years ago when he could no longer bear the restrictions or the constant tension with his father. He d written too many unanswered letters to his mother and found himself incapable of putting down any roots in his new home in Missouri. Success in work could not replace the family that denied Aaron, even after all of these years. Aaron hastily returns to the Amish community of Paradise, PA, after receiving word of his mother’s stroke. Hesitant to get too close to the family he was once a part of, he decides to stay at the Heart of Paradise Bed & Breakfast. He soon encounters Linda, working there part-time, and they begin to develop a friendship. Aaron’s return allows him to reconnect with his family as he jumps into home improvement projects, hoping to make his parents house more accessible to his handicapped mother. But before long, he is enraged to learn that his brother, Solomon, had hidden all of Aaron’s letters to their mother. Linda and Aaron must each learn to forgive the family members who have deceived and forsaken them. And Aaron must also show Linda that she is worthy of his love. Amy is hosting the last of her SPECIAL Facebook chat parties on her Facebook Author page this Tuesday! It’s definitely a one-of-a-kind story! Don’t miss it! Moving to Pennsylvania wasn’t in Madeleine’s original plans. She should still be in California and should have married her pilot fiance a year ago-but death has a way of changing everything. Now the former Air Force flight nurse is living alone in Paradise, Pennsylvania, and working as a maid at the Lancaster Grand Hotel. She isn’t exactly a widow . . . but she sure feels like one. Saul Beiler isn’t exactly a widower . . . but his wife is long gone. His eleven-year-old daughter, Emma, doesn’t know that her mother fled the Amish community-and married another man-but she does know that her dat is lonely, and that a pretty young maedel just moved in next door. Madeline’s numb heart begins to thaw as she spends more time with the innocent and ever optimistic Emma. The stronger her friendship grows with the young girl, the more intrigued Madeline grows about the humble, strong, man raising her on his own. But even as a strange attraction pulls Saul and Madeleine across a stark cultural divide, they-and everybody else-have to wonder: What could they possibly have in common besides heartache? Will love allow Madeleine to finally find the home she’s been dreaming of all along? You can find more information HERE at Amy’s website, along with links that will point you to where you can purchase the book. Each Tuesday, Amy will be hosting a SPECIAL Facebook chat party on her Facebook Author page! 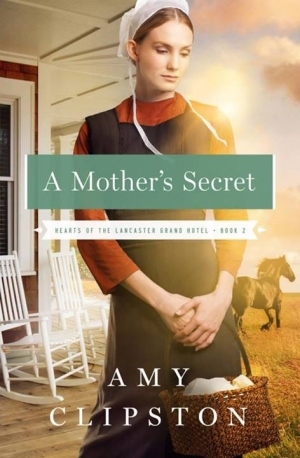 In A Mother’s Secret—the second book in a wonderful Amish series by bestselling author Amy Clipston—Carolyn Lapp dreams of marrying for love. But will the errors of her past destroy this dream forever? Carolyn Lapp longs to have a traditional Amish family. But she lives on her brother’s farm with her parents and her 15-year old son, Benjamin. Carolyn has never revealed the identity of Benjamin’s father and lives daily with the guilt and shame of her youthful indiscretion. Her brother simply will not forgive her. His answer is to arrange a practical marriage for Carolyn to Saul, a widower with a little girl. But Carolyn isn’t convinced that Saul really loves her and believes he is simply looking for someone to help raise his daughter. When Benjamin causes trouble at a local horse auction, horse breeder Joshua Glick decides that he must be taught a lesson. Carolyn and Joshua are unmistakably drawn to each other, but Joshua mistakenly assumes that Benjamin is Carolyn’s brother. Carolyn fears that if he discovers the truth, her past will destroy their budding romance. After years of shame and loneliness, Carolyn suddenly has two men vying for her attention. But which of them will give her the family—and the unconditional love—she’s longed for? It’s a WONDERFUL book, a very moving story! 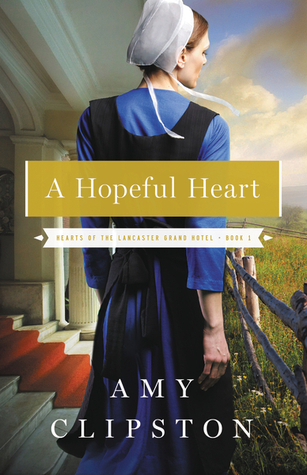 In Hopeful Heart—the first book in the Hearts of the Lancaster Grand Hotel series by bestselling author Amy Clipston—Hannah Glick, a recently widowed Old Order Amish woman, struggles to support her three children after unexpectedly losing her husband. When she meets a nice Englisher (non-Amish man) at the luxury hotel where she works, her world is turned upside down while she tries to decipher God’s plan for her. Book 3 in Amy Clipston’s Hearts of the Lancaster Grand Hotel is FINALLY HERE! 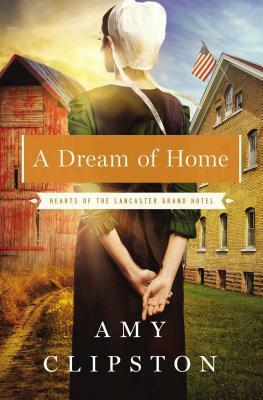 A Dream of Home is the 3rd novel in Amy Clipston’s “The Hearts of the Lancaster Grand Hotel” series It is scheduled to be released November 4, 2014. Yes, I got an early look! I LOVE being a book reviewer! OK… now about the story. I have never been a combat nurse but there are a few things in my past that occasionally come back to haunt me so I feel a sort of kinship with Madeline Miller. It also helps that Amy Clipston writes her nightmares so well that you truly feel like you’re right there, experiencing it with her. I did not feel a kinship to Saul Beiler however. Actually, when I was reading book 2: A Mother’s Secret, he nearly knocked Barbie off the pedestal of most disliked characters. He was just so rude and abrupt and… well, annoying. I NEVER could have imagined that Saul would be remotely interested in a REAL relationship. I was sure he was just one of those controlling and angry men who hide behind their religious convictions. I love that Amy Clipston occasionally throws you a crazy curve ball! It keeps her books interesting in a way that not many authors think of. And I am NOT giving anything away about the story! You’ll just have to read it for yourself! Trust me when I say that it is WORTH a read! And keep watching! Amy has ANOTHER book coming in this series. It’s slotted to release next year. And I’m sure A Simple Prayer will be just as fantastic as the first three in the series! I ranted more than a little with my review of the first book in this series: A Hopeful Heart, because someone ruined the book for me. Which is why, In preparation for this book, I did not read ANY reviews. Besides… I knew it would be great! Why would I need to read reviews! A Mother’s Secret is a absolute masterpiece. Amy Clipston has taken a delicate, sensitive subject and put a face on it that I certainly never expected to see. I have read books by other authors of Amish fiction about this same subject but most of them focus on the shame in their community or the hardship on the mother or the ostracism from family. A Mother’s Secret takes a whole new approach and I LOVE IT! Yes there is mention of the “shame” Carolyn’s “situation” brought to the family but it is not the focus of the story, except for how much Carolyn punishes herself about it. The community has forgiven her – but that’s really what we expect from an Amish community, isn’t it? And yes, there is mention of the hardship on Carolyn but it’s primarily past-tense for this story and only as it contributes to the story, again…not the focus. It’s nothing like what you read about in many other books that seem to make the hardship a single mother deals with the main focus of the story. And while there is friction between Joshua and his mother… and Carolyn and Joshua’s mother… and Benjamin and Joshua’s mother – noticing a pattern here… if you read the first book, you know Barbie causes friction between her and almost everyone around her – there is no ostracism from Carolyn’s own family, which…again, is what you would expect from an Amish family. The Amish are famous for their forgiveness. This is the story of a mother and her son. It highlights the family dynamics that come with this somewhat unique situation but it clearly focuses on the mother and son. And Amy Clipston does a beautiful job of writing, not just a love story between Carolyn and her possible suitors, but between Carolyn and her son – who she and her family consider a blessing… not a burden like many other families might. Perhaps it is the Amish worldview that helps them accomplish this or perhaps it is simply due to their intense faith in God and their strong desire to live as Christ-like a life as possible. Whatever the reason, Amy Clipston hit the mark perfectly with this book! I must have rewritten and added to this review a dozen or more times – I kept thinking of things I had to add or a different way I wanted to say something and I just had to get it right! This is a tremendous story and I hope everyone who reads it gets as much of a blessing from it as I have. God Bless you Amy Clipston! Now I’m impatient for the next book, “A Simple Prayer, which is the final book in my Hearts of Lancaster Grand Hotel series” – via AmyClipston.com. Carolyn Lapp longs to have a traditional Amish family. But she lives on her brother’s farm with her parents and her 15-year old son, Benjamin. Carolyn has never revealed the identity of Benjamin’s father and lives daily with the guilt and shame of her youthful indiscretion. Her brother simply will not forgive her. His answer is to arrange a practical marriage for Carolyn to Saul, a widower with a little girl. But Carolyn isn’t convinced that Saul really loves her and believes he is simply looking for someone to help raise his daughter. When Benjamin causes trouble at a local horse auction, horse breeder Joshua Glick decides that he must be taught a lesson. Carolyn and Joshua are unmistakably drawn to each other, but Joshua mistakenly assumes that Benjamin is Carolyn’s brother. Carolyn fears that if he discovers the truth, her past will destroy their budding romance. After years of shame and loneliness, Carolyn suddenly has two men vying for her attention. But which of them will give her the family—and the unconditional love—she’s longed for? And HERE for Amy Clipston’s website. First let me say that I do not enjoy having a book ruined for me by spoilers. GoodReads has spoiler settings for a reason people. Use it. OK. Now that I’ve gotten that out of my system. Even though some incredibly rude person (who also didn’t like the book) essentially ruined the ending for me, I went ahead and read the book because it started out really well (when I read that review, I was already about 15 pages into the story) and I wanted to see it through. I really enjoyed the book. Amy Clipston’s writing is truly amazing. She really puts you “in” the story! At one point, a character is sitting in the rain and its so well-written, I could almost hear the rain all around me. Amy’s character development is wonderful. I may not like all of the characters but I can’t deny that they’re written well. Plus the story has a real ring of truth and that’s such a plus for me! You all know how I feel about the “Amish” novels that aren’t really true to Amish life. I can also tell you that Amy Clipston is an awesome person. I recently requested a bookmark and bookplate from her and she sent me 5 bookmarks and 4 bookplates! She’s so awesome! Kauffman Bakery series next! I can’t wait to read her next book! I received this book free for an honest review from NetGalley. You can find more info about “A Hopeful Heart” HERE at NetGalley You can learn more about Amy Clipston and her novels HERE and more about this book at GoodReads HERE!